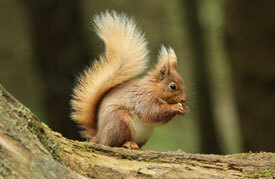 Northern Red Squirrels » Report Sightings » Red or Grey? It can sometimes be hard to distinguish between red and grey squirrels. This quick guide helps you to tell the difference between the two species. Surprisingly, coat colour is not a reliable indicator of species. 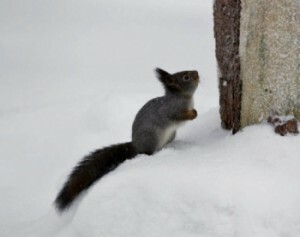 Grey squirrels can often have very red fur and red squirrels’ coats can vary from a bright, rusty red to quite a dark colour, sometimes grey or almost black. 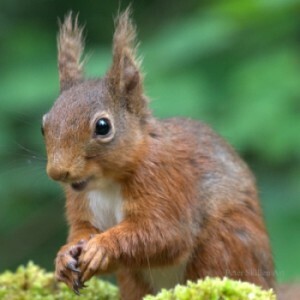 Grey squirrels never have ear tufts, so if the squirrel you’ve spotted has got ear tufts, it is definitely a red squirrel. But if ear tufts are absent, it could still be a red squirrel that you’ve seen, so you should look for other distinguishing features. 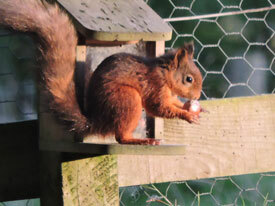 Ear tufts on red squirrels are moulted in the summer and become more prominent in winter. An obvious distinguishing factor is size, with grey squirrels generally being much bigger and stockier than reds. However, there are individual variations and young greys will reach a similar size to adult reds before they become fully grown. It’s worth bearing in mind that in mild weather and with a good supply of food grey squirrels will carry on breeding well into the winter months, so young greys are not just seen in the spring. 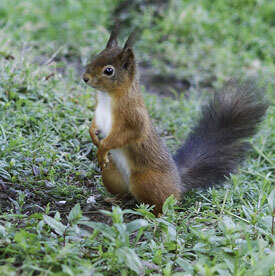 Red squirrels weigh between 270-360g and with a head and body length of 19-23cm. 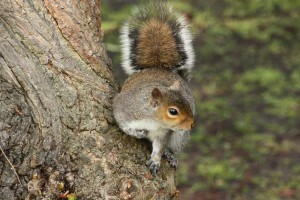 Grey squirrels typically weigh between 400-720g with a head and body length of 25-30cm. Another way to tell the difference between the two species is to look carefully at the tail. Each individual hair on a grey squirrel’s tail is made up of bands of colour, with each one having a white tip. Together these white tips combine to create a distinctive white ‘halo’ effect around the tail which is visible even in poor light. 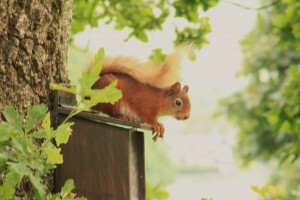 Red squirrels can have tail colours varying from dark to almost white, but there is no ‘halo’ effect because their individual tail hairs are not banded like a grey squirrel’s.